This cute American Tree Sparrow is showing off his rusty cap and you can also see his mark on the middle of his chest which looks like a stickpin. I took this pic a few weeks ago before all of our leaves came out and when he may have been on his way further north. We don't see these sparrows down here...well, at least I don't. It may be too warm for them. We have sparrows but they are grey and dull. Your sparrow looks a lot more fun! There are so many sparrows in the world, but each one is unique and special! Fine bird photo. We get these little guys around our house too. Hello, that is a great bird to have on the feeder. I do not see them here often, lucky you! Thank you for linking up and sharing your post. Happy Saturday, enjoy your day and weekend. aw...he looks like he's napping? I love little birds. A neat looking little bird! Neat photo of the sweet red capped bird ~ our feathered friend! He's probably keeping an eye out for squirrels. So cute. You don't often get to see the tops of birds' heads too! Cute little guy. Have a wonderful weekend. Nice shot of his beautiful colored head. I am amazed at how many species of sparrows there are. He's so sweet Pat. 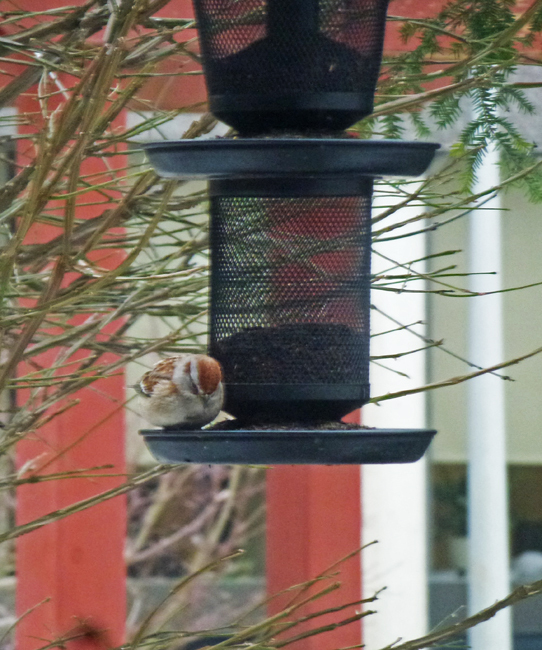 The trick to snapping little birds is definitely the feeders, must get one! Bowing his head in thanks for the delicious banquet! Nice looker, with a cap matching the color of the pillars behind. Too busy eating no time for photo ops!